National Cancer Survivor Day is June 5, 2011. This annual celebration of life honors everyone diagnosed with cancer. One is considered a cancer survivor from the very first day of diagnosis. Each day spent fighting cancer or living in remission is one to cherish and enjoy. A cancer survivor honors every moment of life by seizing the opportunity to lead an active and productive lifestyle. MyWalkGear.com salutes all valiant cancer survivors on June 5th and every day of the year. Support and awareness are helpful components when dealing with cancer. People can express their support and raise awareness by finding a local Cancer Survivor Walk. Numerous hospitals, charitable organizations, cancer treatment centers and local communities have awareness walks scheduled for June 5, 2011. Additional cancer awareness walks are scheduled throughout the year, MyWalkGear.com recommends visiting the National Cancer Survivors Day website and the American Cancer Society website for valuable information regarding cancer survivor events and valuable cancer awareness education. 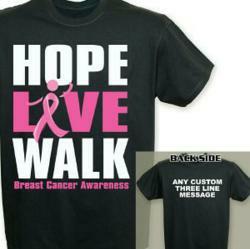 MyWalkGear.com is here to provide Awareness Shirts to make the day one to remember always. In addition, all awareness walk events allow for same day registration, so it is never too late to get out there and walk a mile or two for a great cause. MyWalkGear.com focuses on assisting benefit, relay and walk teams look great for their local walk & fundraising events. Whether you are a member of a team or simply a single person raising awareness for a cause, MyWalkGear.com offers a wide selection of personalized walk apparel. Team unity starts with coordinating team gear. MyWalkGear.com provides the single shopping source for personalized team apparel and coordinating walk gear. Be sure to Like Us on Facebook at Facebook.com/MyWalkGear. MyWalkGear.com provides a wonderful forum for sharing team photos and personal notes regarding an awareness event. Customer service team is available M-F from 8:30 a.m. - 4:00 p.m. at 1-800-470-1446 or via email service(at)mywalkgear(dot)com.